Back pain is pervasive among Canadian adults, but a new and disturbing trend is emerging. Young children are suffering from back pain much earlier than previous generations, and the use of overweight backpacks is a contributing factor, according to the Ontario Chiropractic Association (OCA). In fact, the Consumer Product Safety Commission reports that backpack-related injuries sent more than 7,000 people to the emergency room in 2001 alone. In my own practice, I have noticed a marked increase in the number of young children who are complaining about back, neck and shoulder pain, said Dr. George Traitses. The first question I ask these patients is, Do you carry a backpack to school? Almost always, the answer is yes. This new back pain trend among youngsters isn’t surprising when you consider the disproportionate amounts of weight they carry in their backpacks – often slung over just one shoulder. According to Dr. Traitses, a recent study conducted in Italy found that the average child carries a backpack that would be the equivalent of a 39-pound burden for the average adult man, or a 29-pound load for the average adult woman. 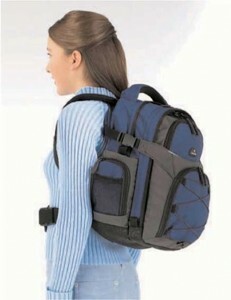 Of those children in the study who carried heavy backpacks to school, 60 percent had experienced back pain as a result. Dr. Traitses also reports that preliminary results of studies being conducted in France show that the longer a child wears a backpack, the longer it takes for a curvature or deformity of the spine to correct itself. The question that needs to be addressed next is, does it ever return to normal? The results of these types of studies are especially important as more and more school districts – many of them in urban areas – remove lockers from the premises, forcing students to carry their books with them all day long. The problem has become so widespread, that some school districts recently passed regulations that would force school districts to develop ways of reducing the weight of students backpacks. The OCA suggests limiting the backpacks weight to no more than 10 percent of the child’s body weight and urging the use of ergonomically correct backpacks. Dr. Traitses offers the following tips to help prevent the needless pain that backpack misuse could cause the students in your household. A backpack with individualized compartments helps in positioning the contents most effectively. Make sure that pointy or bulky objects are packed away from the area that will rest on your child’s back. Bigger is not necessarily better. The more room there is in a backpack, the more your child will carry-and the heavier the backpack will be. Urge your child to wear both shoulder straps. Wide, padded straps are very important. Non-padded straps are uncomfortable, and can dig into your child’s shoulders. The shoulder straps should be adjustable so the backpack to fit to your child’s body. Straps that are too loose can cause the backpack to dangle, causing spinal misalignment and pain. Although the use of rollerpacks – or backpacks on wheels – has become popular in recent years, the OCA is now recommending that they be used cautiously and on a limited basis by only those students who are not physically able to carry a backpack. Some school districts have begun banning the use of rollerpacks because they clutter hallways, resulting in dangerous trips and falls.